Pellon High Five has published the first newsletter of 2018, which can be downloaded here. Run by Pellon High Five 50+ Community Group, every shape and size is right for these classes, it doesn’t matter how much, or how little, you can do. High Five caters for different levels of fitness and laugh with each other sometimes at our inability to master some moves! Most people will admit to being nervous about going to a “Keep Fit” class, so if you’re worried about coming to your first class on your own, call to arrange for someone to meet you as you arrive. All our new members say what a friendly bunch of folk they are and how welcome they were made. So what are you waiting for? Your first class is free & subsequent classes £3. Exercise does so many brilliant things for your body & brain. If doctors could put it in pill form & bottle it we would all be rushing to get a prescription. How about a new year’s resolution to spend less time on the settee & more moving. Pilates can be gentle for those who have injuries but strenuous for those who need a challenge. 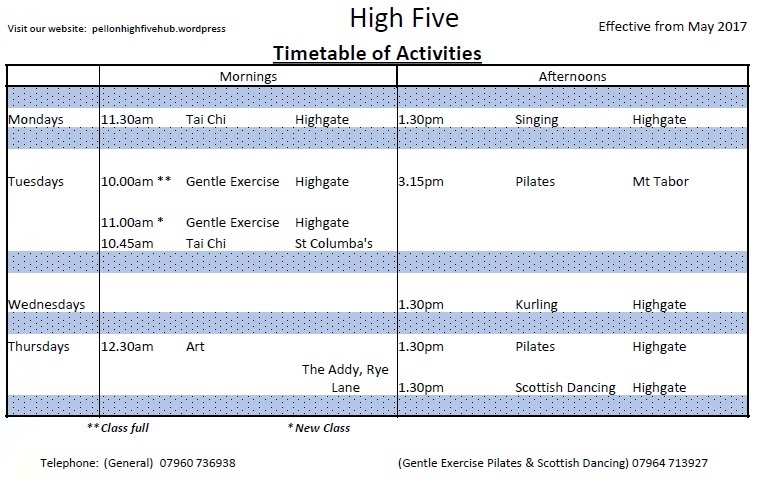 Our clinical Pilates classes cost £3 for an hour session. Again your first class is free. You will strengthen the muscles that support your body. These muscles could also help to reduce wear & tear on joints & keep them functioning. Good posture is important in helping to reduce back pain. The classes do not run every week so please email before going. More information can be found from the tutor Sue Watson on 07964 713926 or email pellonhighfive@gmail.com or visit the website at www.pellonhighfivehub.wordpress. ← Illingworth Girls Rugby League… Players Wanted!